It has been a very crazy and busy month or so. I know, it has been a while since I last posted an article but it really has been hectic. Because of the time restraint, it has taken me months to complete this cowl and I have to admit that I am very pleased with the end result. The Linen Chevron Cowl was knitted using Shi Bui’s Linen yarn and it features a distinctive chevron design. Because the pattern is a little long, I’m going to keep this intro short and jump into the fun part…the pattern. I absolutely love the chevron/seed stitch combination. CO 170 sts. Place stitch marker and begin to knit in the round. Do not twist stitches. Note: always slip stitches purlwise unless otherwise noted. Rd 1: *k1, p1; rep from * to end of round. Rd 2: *p1, k1; rep from * to end of round. Rd 3: *k1, p1; rep from * to end of round. Rd 1: *k2, sl 3 wyif; rep from * to end of round. Rd2: k1, sl 3 wyif, *k2, sl 3 wyif; rep from * to the last st, k1. Rd 3: *sl 3 wyif, k2; rep from * to end of round. Rd 4: sl 2 wyif, k2, *sl 3 wyif, k2; rep from * to the last st, sl 1 wyif. Rd 5: sl 1 wyif, *k2, sl 3 wyif; rep from * to the last 4 sts, k2, sl 2 wyif. Rd 7: repeat Rd 5. Rd 8: repeat Rd 4. Rd 9: repeat Rd 3. Rd 10: repeat Rd 2. Rd 11: repeat Rd 1. Rd 14: *k2, sl 3 wyif; rep from * to end of round. Rd 15: sl 1 wyif, *k2, sl 3 wyif; rep from * to the last 4 sts, k2, sl 2 wyif. Rd 16: sl 2 wyif, k2, *sl 3 wyif, k2; rep from * to the last st, sl 1 wyif. Rd 17: *sl 3 wyif, k2; rep from * to end of round. Rd 18: k1, sl 3 wyif, *k2, sl 3 wyif; rep from * to the last st, k1. Rd 19: repeat Rd 14. Rd 20: repeat Rd 18. Rd 21: repeat Rd 17. Rd 22: repeat Rd 16. Rd 23: repeat Rd 15. Rd 24: repeat Rd 14. Bind off and weave in loose ends. I highly recommend blocking for optimum results. There you go. The Linen Chevron Cowl is complete and now you have a brand new linen cowl that’s perfect for summer! 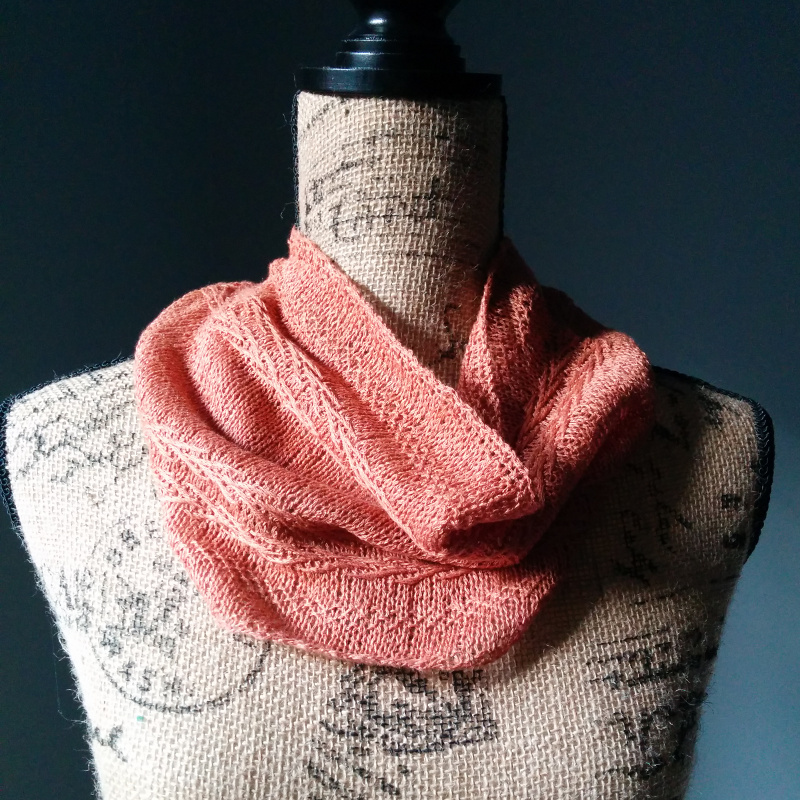 UPDATE: Linen Chevron Cowl pattern is now in French. Gorgeous! Could you please tell me – what are the instructions for row 9? Sorry, that was a typo. It’s repeat Rd 3. You have corrected Rd 9 in the chevron section in the printable pattern, right?? Round 9 says to repeat Round 3. Does it say something different on your end? I’m reading this pattern and I’m just a little confused.There seems to be quite a few rows of Stockinette stitches between each set of Chevron and I do not see it in the instructions. Am I missing something? Knit rounds 12 and 13. But like Pattie,I’m confused because there seems to be more than 2 rows of Stockinette Stitch between the 2 sets of Chevron when you look at the pictures but only 2 rows are knitted in the pattern. How many rows of Stockinette should be in the pattern ? You guys are right. I forgot the main body which is 20 rounds of stockinette. The pattern has been fixed. Thanks! I would like to knit this for our church auction in the Spring. May I have your permission to do so? And would pattern credit go to Purl Avenue or your personal name? It’s absolutely gorgeous! It means “with yarn in front.” Just make sure you bring your working yarn to the front of your work before you work on the next stitch. Sl 3 wyif. Do I sl as to purl or knit? Great cowl, I’m making it for gift. Thanks for such beautiful patterns. I was wondering how to work the pattern on straight needles. I’m not a very experienced knitter. I understand the stockinette and seed stitches and can do them on straight needles. I’m unsure of the chevron stitch part on straight needles. Thanks for any info you can give me! I LOVE the pattern! 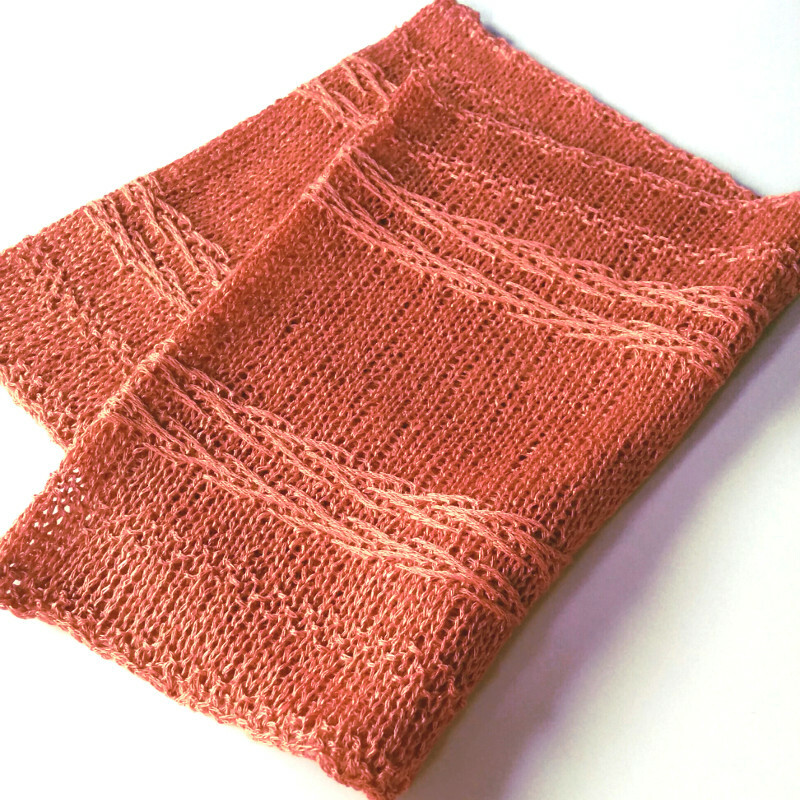 This is a beautiful cowl pattern! I’m thinking it would also make a very pretty table runner if knit on straight needles. Thanks for sharing your creativity! Kathy mechanic, I thought the same thing! Good to know the Chevron Stitch pattern allows for knitting flat instead of in the round. Classy pattern, that’s for sure! “wyif” means with yarn in front. Simply bring your working yarn to the front of your work and move on the the next step. When doing a slip stitch purlwise, is the yarn usually in the back? wyif is clarifying to have the yarn in front as if to purl? Yes, when slipping stitches, it is normally done with the yarn in the back. And yes, with “wyif” just bring the yarn to the front of the work as if to purl. This is lovely! I hope you won’t be offended by my question. Is there a way to knit this on straights? These would be very stylish placemats, so knitting flat would be what I’d need to do. Not at all! Here is the pattern for knitting the chevron flat: http://purlavenue.com/2014/10/chevron-stitch.html. The body is stockinette and then continue to knit the chevron stitch again.